Hello there, today I have some great news to share with you. It has been so hard keeping quiet for the last few months but I can finally announce that I will be part of the new Create A Smile Video Design Team starting in January. 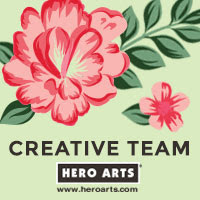 I am so looking forward to being part of this amazing team! (Christine is announcing all the new DT members this week on the blog so please go and have a peek). 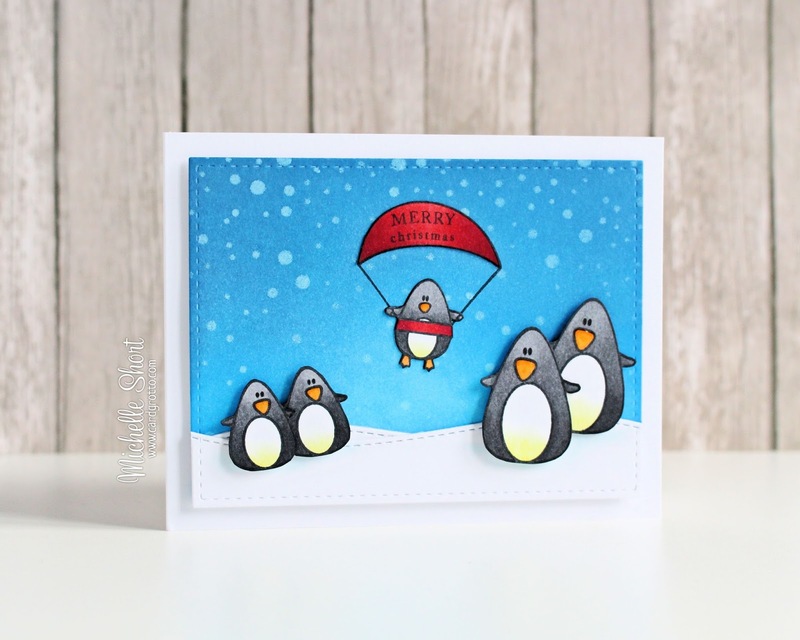 I have been eager to use the Cool Buddies and Penguin Party stamp sets for a while and thought what better occasion is there to share a card I have made using them today. I first took the ME Femme Frame die and cut this twice from white cardstock. With the first, I added TH Distress Inks to it to make a sky. I then used the SSS Falling Snow stencil over the top with white ink for some snow. With the other Femme Frame piece, I have cut it up to make snow banks using the ME Landscape Trio border dies. These have been added to the sky piece with foam tape. 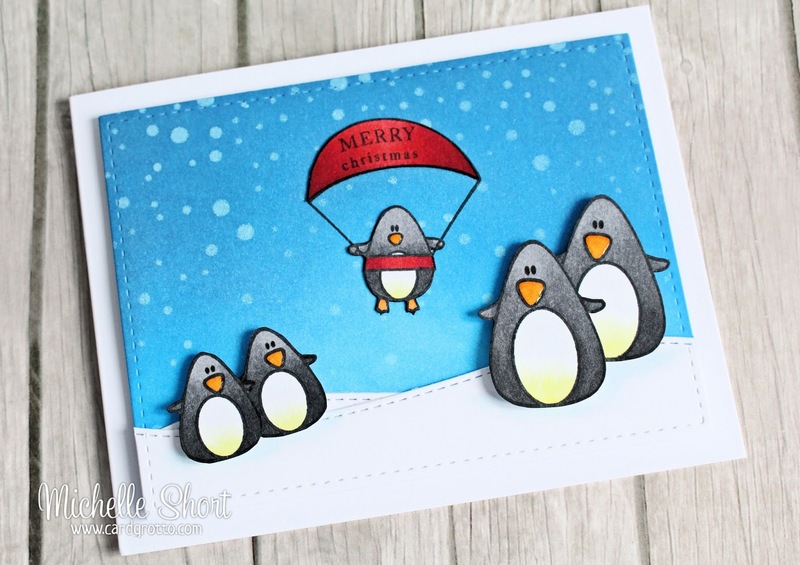 I have stamped the larger and smaller penguins from the Cool Buddies stamp set, as well as the flying penguin image from the Penguin Party set. These have been coloured with Copic Markers and Glossy Accents applied to their beaks. I have fussy cut them out and added them to the scene with foam tape. I have then stamped the little sentiment on to the parachute of the baby penguin. This panel has then been adhered to a white card base. Here are links to what I have used on the card. Click the picture to be taken to where I bought it. Some products can be bought from multiple shops. Abbreviations to shops will be linked below the picture. COPIC MARKERS: N4, N5, N6, N7, N8, N9, YO4, YO11, Y35, YR15, YR16, Y35, R27, R29, R89. The two adult penguins are my brother and sister-in-law, the two child penguins are my niece (age 6) and nephew (age 4) and the baby penguin flying in, is my six month old nephew! :D Thank you so much for stopping by today. Although I still have two gift card holders to share with you, I don't think I will be back now until Boxing Day, so I want to wish all my readers a very MERRY CHRISTMAS! I hope you have a great one filled with love, joy and happiness! Super cute card and congrats!! YAY!!! Merry Christmas!! Just darling, Michelle! So fun that the penguins actually represent some family members, too. Love the baby:) Congratulations on your news! Looking forward to seeing the beautiful cards you will share. Merry Christmas! 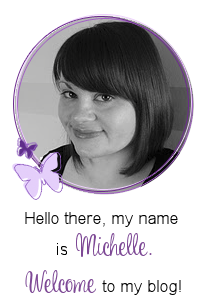 Congratulations Michelle!! Your work is awesome. I'm so glad I found you a couple a couple of months ago. I can't wait to see more of your work! !